We can all remember how great we felt when our favorite teacher praised us for a job well done or a good instructor encouraged us during a tough assignment. We were eager to go the extra mile for these teachers because we knew they believed in us and supported our success. In Inviting Students to Learn, Jenny Edwards shows us how to re-create that same enthusiasm with our own students by choosing our words carefully and creating learning environments that motivate students to be eager to learn and ready to succeed. 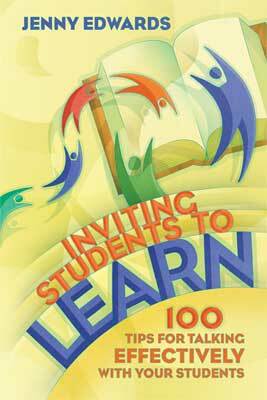 Inviting Students to Learn also contains tips for interacting with parents, reaching out to diverse student groups, and using technology to efficiently communicate with students. Edwards shows us that as we begin to shift our everyday conversations with students, we can boost their self-esteem, improve their knowledge, and increase their desire and willingness to work successfully toward their goals. JENNY EDWARDS, PhD has been working in the field of education for 35 years and has taught at the elementary, middle school, and university levels. In addition, she served in staff development in Jefferson County Schools in Denver, Colorado, for four years and was involved in mentoring first- and second-year teachers and presenting seminars.